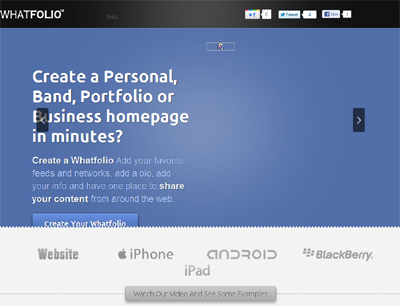 A Whatfolio allows you to create a profile page or portfolio page, for personal pages, models, photographers, actors, bands, presenters, personal trainers, brand, business and others that integrates existing information about you, through social feeds such as Facebook, Twitter, Youtube, Blogger, Tumblr, WordPress, Soundcloud, Bandsintown. Every Whatfolio comes with a Mobile/Blackberry/iPhone/Android/Tablet App design for you, providing the user with a multi device, multi platform presence. Whatfolio – think about.me,bandapps.com, onesheet.com, bandlink all rolled into one. In today’s market, being mobile is the new standard, Whatfolio attempts to bridge the gap offering a across platform service, across mobile device service and does so with much credibility.Having a cross mobile and tablet site which has most of the features of a native app is the turning point. Whatfolio is attempting to set the new standard which will call WMT Presence – which standsa for Website,Mobile Tablet online presence, we feel all sites should be made this way as a standard, and so we are setting the blueprint.